One of these days I will get around to replying to some of the comments that do need a response. Now though is time for an open thread. Say what’s on your mind. Talking of minds, here’s a recent discovery. 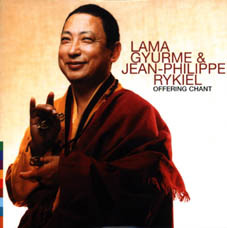 During my recent visit to the East coast, a friend in Philadelphia introduced me to Lama Gyurme’s Buddhist chants. Lama Gyurme is a Buddhist monk born in Bhutan in 1948. At the age of nine, he became a permanent resident of the monastery where he received Buddhist teachings, completed by an initiation to traditional arts, including music. At the age of 20, he followed his first spiritual retreat of three years, three months and three days, necessary to the formation of Lama, at the monastery of Sonada in India of which the director is Kalu Rinpoche. During this retreat, he was given the title of “Oumze” — master of music — by Kalu Rinpoche. Lama Gyurme has been living in Paris since 1974. His collaborator in Paris is Jean-Philippe Rykiel. Rykiel is blind since birth (though he was not born blind.) I like his arrangements. His lightweight keyboard accompaniment is a perfect counterpoint to Gyurme’s heavy voice. The chants are of course soothing — Buddhist chants always are. But it’s more than that. To me it appears that the voice conveys a realization that is attained after years of meditation on the nature of the universe, and its defining characteristics of impermanence and change. The words are from another YouTube video of the same song. Here’s a brief promotional video of Rykiel and Gyurme. Well, that’s it for now. Leave me a comment, or email me what’s on your mind. I’ve been a regular reader of your blog, although I rarely post comments. Reading the latest post of yours is almost routine for me. I’ve been inspired by several of your posts and they have had quite an impact on me. I’ve shared the link to this blog with several friends. Thank you for your kind words of encouragement. I am delighted that you find the blog useful. beautiful visuals as well. wondering which is the city at 5:31 in the video. The “Offering Chant” is wonderful . I’m going to try to find the other songs in the CD as well . I’ve started leaving comments on this blog only recently . Great work , and hopefully some of the future leaders of the country are reading this blog and taking ideas from it ; specially the economics-based logic . Fantastic chant. Closing the eyes opened a whole different world. Shriman I dont know what to make regarding your opinion. According to blog metrics of popularity you have done fairly well on the indian blogosphere, and thats the only reason I have read your blog for around 7 years or so. And now for why I find you quite amusing. You do claim to be for freedom of speech yet had written to a response on your blog post regarding Grahm Staines murder that Mr Staines was asking for it because of his speech. You did retract it, but It reveals more about how you think. It would have been less revealing had it was a verbal blurt, but it was a written response to some one. It took some effort to type it and prior to that think of a response. I find that quite repugnant. I would be interested in seeing the lyrics in Tibetan.